My name is Rasmus Vium Fristed, an old school magic player and long time Vintage enthusiast (since 2001). 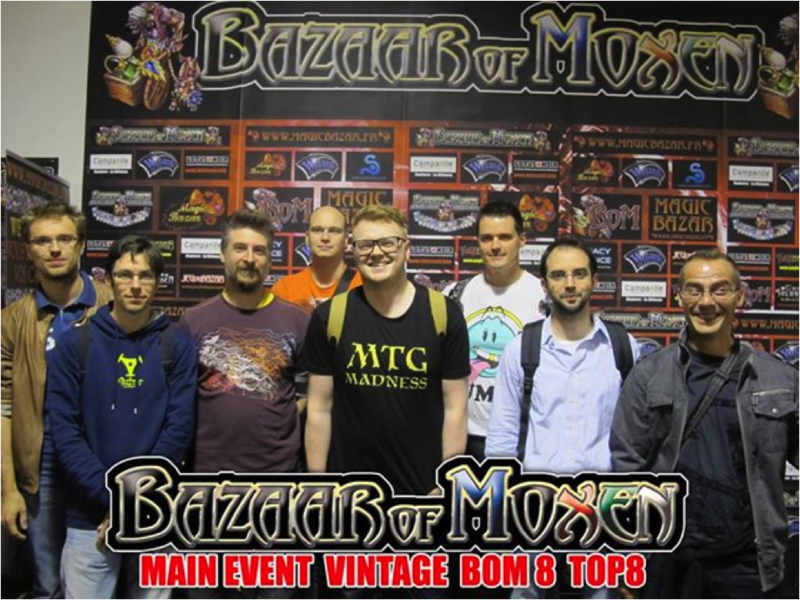 I recently made Top 8 in the main Vintage tournament at Bazaar of Moxen in Paris, and thought I would share my experience. I originally meant to write a report for my fellow Magic players from Denmark in the hope of igniting the smoldering Vintage spark but instead decided to contribute to the global community and write the report in English. The description of the matches may seem a bit excessive, yet I enjoy this kind of descriptions and hope that you do, too. I am the one with the white smiley T-shirt. It began, when Simon Rokkjær, one of my magic-related friends from way back, asked if I wanted to join him and some others for a trip to Paris to Bazaar of Moxen 8. We went to Annecy together in 2011 and that was really an experience, so I signed up immediately. We ended up being six persons in a car (a large one) driving from Denmark to Paris. Five magic players (Simon, Henrik, Jens Peter, Niels and myself) and Jens Peters girlfriend Beatrice. In order to get some testing done, we decided to go wednesday night with scheduled arrival on thursday afternoon. After a long and tiresome drive we arrived at our hotel, which was situated immediately next to the venue, which was very nice. We settled down for some playtesting, which we basically hadn’t done. There was a lot of magic players at the hotel, obviously, which made for quite an atmosphere for magic-hungry souls. 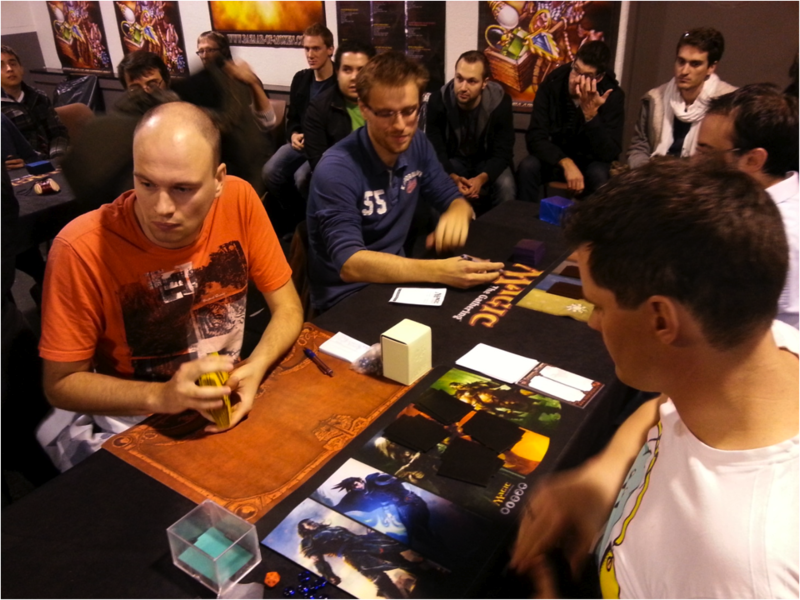 The main event was scheduled on sunday, while there was a trial on saturday with a chance of winning byes to the main event. As we were unable to attend both the vintage and legacy main tournaments, we decided to skip the legacy tournaments altogether and really get some testing done. This meant that we were testing at the hotel for almost all of friday. 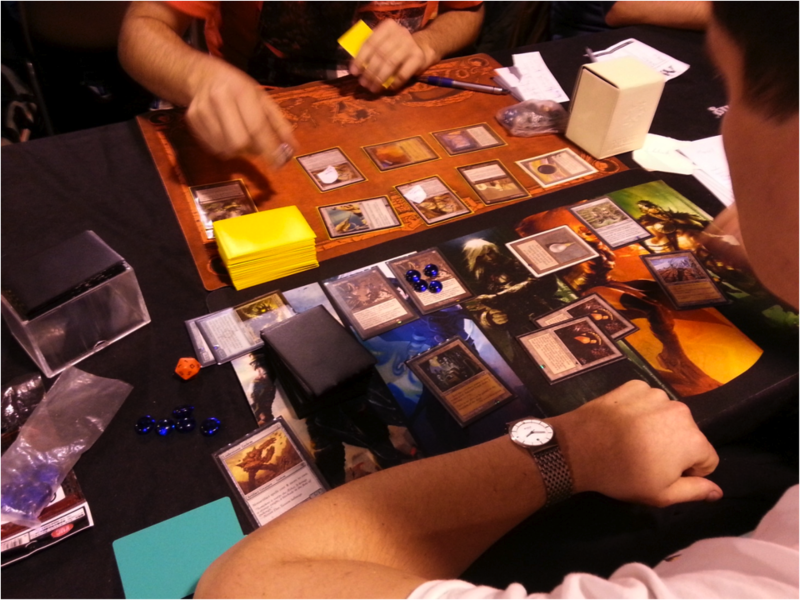 Simon and Henrik were set on playing their U/R Welder Control, and Jens Peter were on Charbelcher. Niels was a bit torn between playing oath and the new Ravager Workshop. In the end he decided to play the Ravager Workshop in the trial and Oath in the main event. When leaving for France I was toying with an idea of a Mud Prison with maindeck Null Rod, as I expected Null Rod to be strong. Instead I was tempted by an interesting list I remembered having seen on the net. It was Jordi Amag Puig´s decklist from Gen Con. I remembered him playing Kuldotha Forgemaster, Metalworker, Lightning Greaves, and Cavern of Souls, which really had the potential for power and fun. I didn´t have a decklist at the moment (having a temporary challenge with the wi-fi at the hotel) , so I build a deck around those core cards. I also remembered seeing a Staff of Nin, which I wanted to try. I have tried a prison style Forgemaster build before where Sphere of Resistance frequently caused me trouble, which is why I left them out and instead opted for the ever trusty Tangle Wires. The idea in short is to disrupt the opponent until the combo comes online. Or, if that is not available, just play a big, possibly hasty and untargetable, creature. Frequently the aim is just to go straight for the combo. I have later come to believe, that this kind of deck may have been played for a while, yet many of my opponents didn´t know about it. The sideboard was constructed mainly to combat Dredge, Oath, workshop and fish-style decks. I won´t go into an in-depth description of the sideboarding in this report, though. Saturday arrived, and we participated in the vintage trial with about 35 players, I think. Time to find out how good the deck was. I really didn´t want to face Simon as I knew him to be on a deck specifically designed to beat artifacts. His maindeck contained Goblin Welder, Gorilla Shaman, Lightning Bolt, Smash to Smithereens, FoW, Mana Drain and Snapcasters, which combined spells serious trouble for my deck. My gameplan is to hopefully stick a Chalice@1 and use Caverns to play uncounterable threats. Simon won the die roll, and we both kept. It was basically over from there with Smash to Smithereens also joining the fray. Had I started, I would have played a Chalice@1, which would have drawn the FoW, making it a more interesting game. I can´t say that I would have won anyway though. I´ve forgotten most of the details but my notes tell me that I met an early FoW. At one point I managed to stick a Forgemaster against an empty board and hand. Simon ripped a Smash to Smithereens, and I never recovered. A disappointing start yet not a surprising one the matchup considered. Especially since Simon was able to bring in more hate from the sideboard, while I had nothing against him in the sideboard. Kristoffer won the die roll, and we both kept our opening hands. Me: Tomb, Greaves – he activated the Bazaar. Him: Dredging a whole lot, having two Bazaars. Some Bloodghasts and Narcomoebas came into play. Me: Land, moxes, Forgemaster->equip-Blightsteel-equip->attack, he blocked. Him: Kill me with a horde of zombies, Ichorids and Bloodghasts. So I lost the first game despite attacking with a Blightsteel Colossus on my second turn. Darn you die roll! I brought in the Cages and Crypts. I kept my seven, while Kristoffer took three mulligans. Me: Wasteland, Cage, Crypt (can´t be unhappy). From there I wasted his Bazaar and removed his graveyard after his first activation, which prevented him from dredging and his Petrifield Field from bringing back the bazaar. I quickly took the game from there. Kristoffer took a mulligan, while I kept my seven. I don´t remember this game except that I had multiple hate including a Cage again. I believe that I at some point sealed the game with a Trinisphere protecting my hate. Pierre got a game loss for being three minutes late. A harsh ruling but the judges were very strict and consequent on this matter. A judge explained that they aimed at reducing unnecessary delays to a minimum. Pierre mulliganed twice, while I kept my seven. Me: Workshop, Sol Ring, Chalice of the Void set to 2. From there Pierre only played a Preordain for the rest of the game, while two Metalworkers beat him down. During the game I played another Chalice at 2 and a Chalice at 3 (to stop Show and Tell). It was very tough luck for Pierre but I was happy to win. Kadir was a nice fellow who attended his first big tournament. He ended up doing quite well despite of that though. We got deckchecked but both escaped without a game loss. As a result we received 12 minutes of extra time. I am not at all able to precisely recall these games, as they were very long and complicated. Kadir won the die roll, and we both kept our seven. This game came down to Kadir being able to remove my threats with Swords to Plowshares while establishing a superior board position from which I couldn´t recover. I began with a turn 1 Lodestone, which went all the way combined with additional disruption, most likely a Tangle Wire. Game 3 was an extremely lengthy and difficult affair with the battle raging back and forth. It was complicated by many permanents on each side combined with lifegain from my Wurmcoil and his Batterskull. I believe that we were both fatigued at this point and, combined with heavy time pressure, as a consequence we made a lot of errors. In the end I won by being able to get Hellkite into play, which slowly turned the match in my favor. I won on the third or fourth extra turn. Fortunately for me, Kadir never saw any of his Swords to plowshares or Ingot Chewers in this game. During this match I really felt the lack of food and drink in the course of the day. You really have to stay fresh and get enough energy, which I usually preach to everyone around me. Even then, it is easy to fall into the trap. There are nice persons and then there are the really pleasant ones. Timur is of the last kind and I really enjoyed the banter. Especially after such a grueling and hard fought match in the last round. I won the die roll and mulliganed to four, while Timur kept his seven. I couldn´t really put on any pressure and quickly lost to a Myr Battlesphere. In this game Timur managed to keep me at bay, and it was looking steadily worse. Then I drew a mox for my Tolarian Academy, played Cavern of Souls on Golems and used my precise twelve mana and last card to put an uncounterable Blightsteel Colossus into play. Timur didn´t find a solution on his turn, and we were on to the last game. He afterwards showed me a hand of FoW, blue card and Ingot Chewer. Hooray for indestructibility and Cavern of Souls. Mana Crypt, Mox Pearl, Lightning Greaves, Metalworker, Kuldotha Forgemaster + two artifacts. The third game was really Vintage showing off. Luckily I had the most broken hand. Actually, I would have killed him on turn one, had he not had the FoW. So I ended up with a 4-1 score. Luckily for me, all 4-1´s were awarded a German or Italian Taiga plus a bye for the main tournament the next day. When going to France I intended to play combo in the main tournament. Yet, I felt that the Forgemasterdeck really had potential. So did my friends, so I decided to play it again in the main event. We playtested a bit at the hotel after going out for some dinner. Speaking of dinner we wound up in a completely deserted part of the city, when we followed the GPS in the car. At one point we found ourselves in the middle of a building complex with an atmosphere that bore a remarkable resemblance to the many zombie movies out there. No such thing happened though and we made it out. I felt that the Lightning Greaves were really pulling their weight and decided to up the count to four. The Steel Hellkite felt good enough for the maindeck an also made the 60. The Crucibles hadn´t really helped me a whole lot in the main, so they were put in the sideboard to combat mana denial. Finally time for the most exciting event of the year for me. This time I was prepared with water and chocolate and a plan of eating and drinking enough between rounds. 152 players participated in the tournament. I was actually late for this round because I couldn´t find myself on the list (as it turned out, I was looking at the list with the wrong part of the alphabet…). I hurried to the judge table which confirmed that I was indeed in the tournament and pointed me to the correct table. I hurried to the table, where a judge was waiting for me. I wasn´t handed a game loss, since I went to the judge table and we instead received one minute of extra time. Phew. I apologized to my opponent for the delay, and we shuffled up. Babin won the die roll. We both took a mulligan. Me: Ancient Tomb, Mox, Metalworker. Him: Land, Mox, Gorilla Shaman, eat my Mox. Me: Reveal a bunch of artifacts, Greaves, Chalice, Forgemaster->equip->Blightsteel->equip->attack. Babin mulliganed twice, while I kept my opening seven. Him: Tap down, land go. Me: Tap down, Tomb, Mox, Mox, Mox, Forgemaster. A second and a third turn kill with a Workshop deck. Quite the way to begin. I never really got to see Babin´s deck in action, so I don´t know exactly what he was playing. Him: Island, Mox, Mana Crypt. Me: Draw Mox, Mox, Mox, Mox, Forgemaster, resolves, equip->Blightsteel->equip-attack. I didn´t sideboard. Antonio took a mulligan, while I kept my opening seven. Me: Chalice of the Void set to 1, Lodestone Golem. Me: Metalworker <- FoW, Forgemaster. Me: Staff of Nin, Greaves, Forgemaster->Blightsteel->equip->attack. I never really got to see Antonio´s deck in action, so I don´t know exactly what he was playing. He most likely didn´t draw very well. Marius got a game loss for being two minutes late, which clearly upset him. Yet, the judges had decided to accept no unjustified delays and ruled accordingly. Marius begins with no sideboarding. We both kept our hands. I am not able to recount the game in detail. We both played a lot of artifacts but my Forgemaster came online the turn before his, which decided the game, as I removed his Forgemaster with a Duplicant. I also managed to draw both of my Wurmcoils and a timely Tolarian Academy. Mathieu was very friendly and a real pleasure to play against. Unfortunately for him this just wasn´t his match at all. I knew Mathieu to be playing Dredge and therefore mulliganed an otherwise decent hand looking for my combo. I kept a hand containing Ancient Tomb, Lightning Greaves, Kuldotha Forgemaster and three other cards. I didn´t have the mana to play the Forgemaster yet but had the opportunity of killing fast with a proper topdeck. Mathieu just kept throwing back hands without Bazaars or Serum Powders ending up with just a single card. He went first. Me: Topdeck Metalworker, land, Metalworker, equip, show a bunch of artifacts, Forgemaster, equip -> Blightsteel, equip, attack. A second turn kill and a very nice game 1 win. As was evident in my second match in the trial a second turn attack with a Blightsteel isn´t necessarily enough against Dredge. I boarded in the Cages and Crypts for Thorns, Wires, and the Duplicant. An interesting hand. Only the Mox for mana but with both a Cage and a Crypt. With those I could keep him down for a while. If I could draw mana, I might be able to protect one of them with a Chalice at one and eventually play golems. I decided to keep. Matieu took another mulligan. Me: Draw Strip Mine, Strip Mine, destroy City, Mox, Cage Crypt. Me: Draw Workshop (so lucky), Workshop, Lodestone Golem. From there the game was basically over. I won the die roll and took a mulligan, while Francois kept. I don´t have specific notes on this nor remember it in detail. Francois played some Forbidden Orchards but didn´t do much otherwise, never finding an Oath. I believe I had a Chalice of the Void set to 1 while beating him down with creatures. At some point I was hit by a Hurkyl´s Recall but it didn´t change the outcome. I boarded in my 4 Grafdigger´s Cages, taking out the Thorns and another card. I considered not boarding in the Cages because of the Oath players tactic of boarding in Laboratory Maniac but decided to stick with the plan. Francois took a mulligan, while I kept my opening seven. Him: Land, Mox, Sol Ring, Time Vault. Me: Mox, Mox, Mox, Mana Crypt, Cavern of Souls (Dragon), Steel Hellkite. A first turn uncounterable Hellkite isn´t too shabby. Francois didn´t find his Voltaic Key the next turn, so I destroyed the Vault on my attack. From there I basically just attacked with the Hellkite, though the game lasted some more turns and some more plays. At some point I got a Cage on the table and Francois an Oath. At this point I can ID into Top 8, if I am paired against one of the other players at 6-0. We intentionally draw. I didn´t get to see exactly what Pierrick was playing. I just knew it to be Workshops. We intentionally draw. I thought I might be a lock for top 8 but I didn´t want to take the risk and appreciated the break. As a result of all my ID´ing I end up in sixth place in the seedings. One could argue that I should have played the last round but I didn´t feel completely secure in my breakers and wasn´t exactly ecstatic about my chances against the winner-to-be of the tournament. The reason for this was that Michael was maindecking Null Rod and had Energy Flux in the sideboard, coupled with Abrupt Decay, Steel Sabotage, and probably more. All said I preferred the break and sure entry to Top 8. In the quarterfinals I was to play against Marcel, a nice fellow from the Netherlands. I knew him to be on workshop but didn´t know the particular build. We rolled the die, and I went first. Not impressive. I was on the play though and had the random chance of manascrewing Marcel with chalice at zero and the wasteland with a slow follow-up, so I kept rather than going to five. Marcel kept his opening seven. Me: Wasteland, Chalice at zero. Him: Wasteland, waste my Wasteland. It lasted a few turns longer but I just got steamrolled from there by Blightsteel, Wurmcoil, and Forgemaster. Not much to do except recognizing that I was playing the mirror. I should have played the Cavern first of course but it didn´t make any difference. Marcel showed a very nice tech in the form of a maindeck Grafdigger´s Cage nullifying my Forgemasters. I put in 4 Dismember, 2 Crucibles, and the Duplicant for the Thorns and Chalices. This hand has huge potential though lacking actual threats, so I decided to keep instead of going to five. Marcel kept his opening seven. Him: Ancient Tomb, Sol Ring, Metalworker. I knew I was in trouble facing that start and thought a real topdeck would be nice. Lo and behold! A Forgemaster was waiting at the top! Me: Reveal two artifacts, land, Greaves, Forgemaster -> Blightsteel -> equip -> attack. Marcel blocked with his metalworker. Quite the topdeck to keep me in the match. Sometimes it pays off to create an opportunity to get lucky. Now to the deciding game. Not impressive at all but probably better than the average five cards. I planned to keep him at bay with the tangle wire while drawing into mana for a hopefully deciding Forgemaster. It was also relevant, that Marcel took a long while before keeping his hand making it very unlikely that he held the nuts. I decided to keep. Him: City of Traitors, go (hmm, strange). Me: Draw Lodestone Golem, Ancient Tomb, Mox Pearl, Tangle Wire. Him: Tapped his land, no play. Me: Tapping my permanents, drew a Workshop, Workshop, Greaves. (him continued): City of Traitors, Metalworker, Pithing Needle naming Lightning Greaves. That was horrible. Not only did he shut off my combo kill but he also ensured himself plenty of mana in the face of my Tangle Wire. I drew another Tangle Wire and had a difficult decision. My options were to play either Wire, Forgemaster, Wurmcoil or Lodestone. Playing Wire would stall him, but not for long because of my Metalworker. I might play the Wurmcoil or Lodestone in the hope of drawing out his (liklely) sideboarded Duplicants. That would unfortunately leave me completely vulnerable to a Forgemaster on Marcels side barring a six-outs topdeck (My own Duplicants and Dismembers). I decided to put my balls to the wall. Him: Reveal Duplicant and Mox, Play Duplicant removing my Forgemaster (drat). Me: Draw Workshop, Workshop, Wurmcoil Engine. Him: Reveal Duplicant and Mox, Duplicant removing my Wurmcoil (double drat), attack with Duplicant #1. Me: Draw Wasteland, Wasteland, Tangle Wire, Lodestone <- instantly killed by Dismember (triple drat). Him: Attack me to one life. Me: I drew a land and conceded. Thus ended my run at the Bazaar of Moxen 8. I anybody feel I should have played it differently feel free to let me know. Marcel and I discussed the deck afterwards. It turned out that he has been playing it for years to very good results at both BoM and other tournament. Marcel wasn´t playing with Tangle Wires or Cavern of Souls, instead opting for City of Traitors and Grafdigger´s Cage and something else that I don´t know of at the moment. He told me that he had tried Staff of Nin but found it lacking. I would very much have liked to talk further to Marcel but my friends from Denmark was eager to get going for the 14 hour ride home, so I had to leave. I wished Marcel good luck in the semifinals. Final stage of the deciding game. For my efforts I received a Bazaar of Baghdad. Before we left we got to see fellow Dane Michael Bonde advance to the semifinals. First of all I think it was a really well organized tournament, and I had a great time there being with friends that share my passions for the greatest of Magic’s formats, Vintage. I am most definitely coming back another time. Hopefully with the same people plus perhaps some more, if they can be persuaded. I had an incredible run at the BoM with nine victories in a row between the trial and the main event and did not lose a single game in the swiss part of the main event. I certainly were lucky in some situations but in general I really feel that the deck were just powerful. Because of its combo, it is actually able to just plain race an otherwise bad matchup such as oath and also has game against Dredge game one. I believe it to be good against most Workshop builds, not the Ravager though. That one proved to be tough in testing. Mainly because of their speed, card advantage, and Revokers. Null Rod is obviously a real pain, which is the great weakness of this deck. 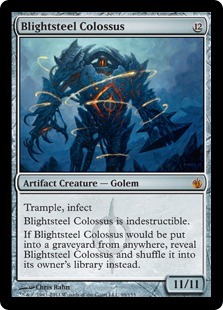 Short of just playing big creatures, maybe Precursor Golem, I have yet to find a solution against that card. Staff of Nin did not really pull its weight and will most likely be replaced with a Wurmcoil Engine or Steel Hellkite. A case can be made for using City of Traitors instead of Carvern of Souls. I believe this to be a metagame decision though. Finally, I am undecided regarding the Tangle Wires. It would seem that most others chooses not to run them, including Marcel whom I met in the quarterfinal. They have been good to me but I will try something else in that spot next time I play the deck, which I most certainly will. As for the metagame I noticed mostly Oath, Grixis Control, and Workshop at the top tables though I also remember a couple of BUG Null Rod decks, Gush, and Dredge. That´s it for now. Any thoughts are appreciated.